I was looking back at past blog posts, seeing which rooms in the house I’ve shared with everyone. That’s when I realized that I never wrote one thing about the kitchen. Maybe I’m blocking out the memories of our DIY remodel. Even so, I decided to start a whole series of posts on our kitchen. I’ll take you through the whole thing from the second we saw our perfectly 1960’s kitchen to our functionally modern present day space. I do hope to break up the posts though, so don’t expect 3 long months of kitchen-only posts. I wouldn’t do that to you, and frankly, I’ll need to space out the memories or I’ll never want to do another DIY project again! To start, we must go back to Memorial Day weekend, 2013. 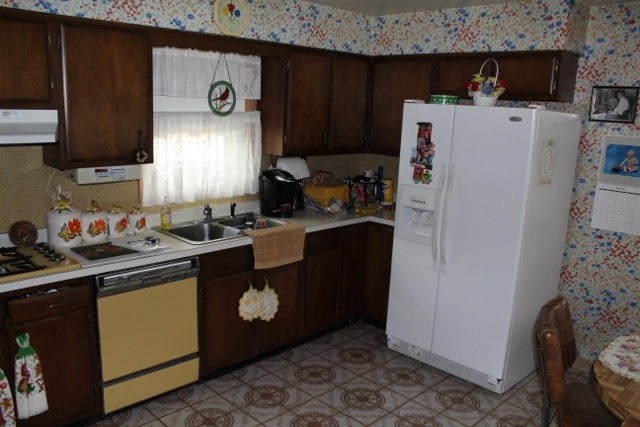 From the first second we got a glimpse of the kitchen while touring our house, we knew two things. 1. 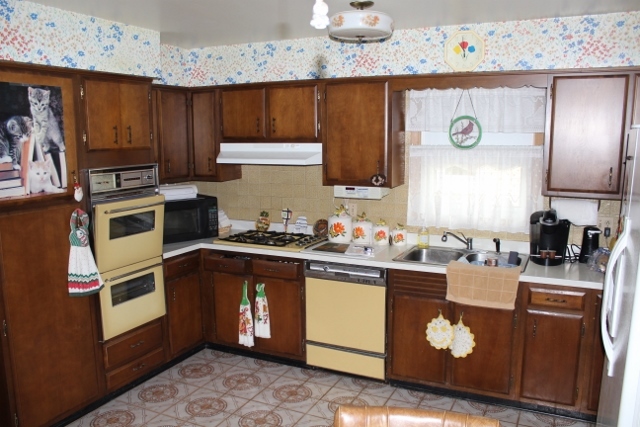 The kitchen was by far the most atrocious room of the home with its original (and non-working) goldenrod appliances, red, white, and blue flowered wallpaper, and dirty, builders’ grade cabinets. If you think I’m exaggerating how bad it was, have a look for yourself. 2. If we bought the house, we were setting ourselves up for a gut remodel starting Day 1. Now, we’re DIYers, so if we bought the house and remodeled the kitchen, we knew we’d be doing most of the work ourselves. Well, challenge (somewhat hesitantly) accepted. The first weekend after we closed, Dan and his dad got to work ripping out the kitchen. They made fast work of it. 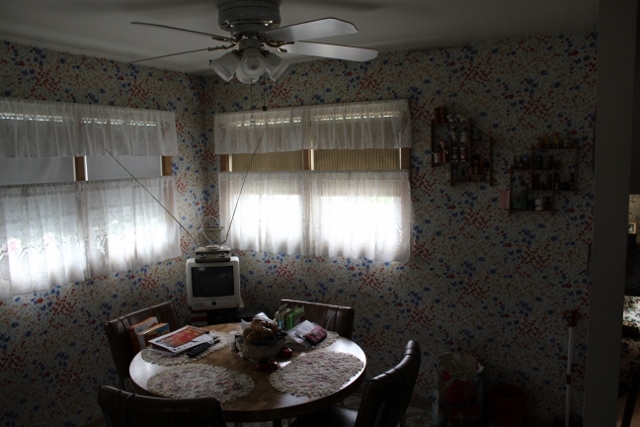 Like, I left to attend a baby shower for a few hours, and returned to a dusty mess of a room without cabinets, a soffit, appliances, backsplash, or floor tiles. I think the fact that our garbage can is in the kitchen in the photo speaks worlds about the situation in the kitchen. 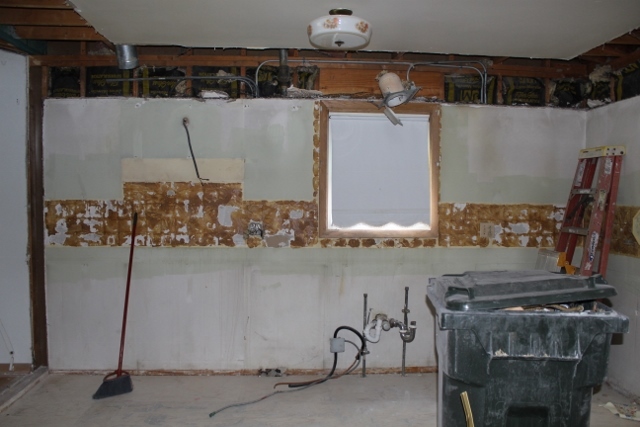 Over the next week or two, we removed wallpaper and, sanded down, patched, and painted the walls. We discussed flooring options and decided the kitchen would look best with hardwood, which was the flooring in the adjoining dining room. While somewhat costly, our floor refinisher easily installed and stained the new wood to look like all the other hardwood in the house. At this point, the kitchen was in pretty good shape in terms of removing all the ugly and getting the room clean and ready for all the new stuff we’d need. And that is how the room remained from about August until late October when our cabinets were installed. I won’t get into how difficult it is to live without a kitchen (VERY difficult) or what kinds of tricks we had to use to eat at the house (a lot of BBQing, crock pot meals, an electric griddle, and paper plates), so I’ll be back next time with the next step in our remodel: appliance shopping.